And you've never been hired by a poor guy, either. Well considering I worked in oil & gas, and poor people buy plenty of fuel, yes I have been hired by a poor guy. That's what conservatives don't understand. The economy is a network not some kind of religious hierarchy with manna falling from heaven. Money flows through it. No, you were hired by their landlord who provides their home heating, or the gas station who buys the fuel. Only on this board is this seen as a "bad" thing. More people are earning $250k? Oh the horror. We must put a stop to this before the poor seem even more poor! Oh the horrors!!!!! Democrats must take some of that. What would have happened if the rich never invested their money but hoarded it? Less jobs, less taxes, less infrastructure, less opportunity, etc, etc. Investment is good, and people do not invest for the fun of it, they invest to make a return. The difference is what we classify as "rich". The people that are hiring and working and paying income taxes are not "rich" and are not manipulating our economy-even if they make $500,000 a year. It is very few people in our Corporatocracy (like a couple hundred families out of 300 Million Americans) that are in control and they have much money off-shore, do not work, hire few meaningful positions and do not pay income taxes. They are the true leeches in our country and system. Income taxation and government regulation is THE LARGEST BARRIER TO WEALTH CREATION IN EXISTENCE. The government will fix income inequality right about the time smoking cures lung cancer. And once again, for the folks who were absent they day they taught economics in Economics class - income is wages, and wages are set by supply & demand for a job in that job's particular market. Until you can fix supply and demand to be equal across all jobs, industries and geographies, incomes will be unequal. This is about as unexpected as water continuing to be wet, btw. Griping on "income inequality" might be one of the easiest ways to spot the economically retarded. Thinking of the economy as a zero sum game with a fixed amount of money shared as a pie, especially in a currency sovereign nation, that would be second way to identify the economically ignorant. Why do you see it as a problem? At the end of the day $250,000 is not that much and there should be more than 2% of Americans making that. 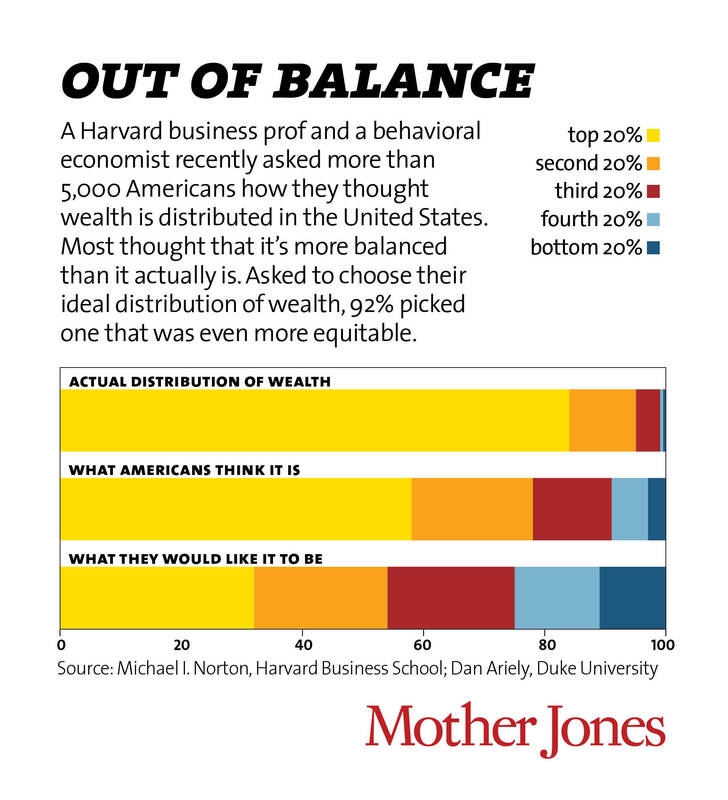 400 people in this country have more wealth than half of all Americans combined and those few hundred elite are trying to lower the bar across the board to make it appear that the $250,000 salaried Doctor barely getting by with student and housing debt and income taxes through the roof is in control and rich, when it is really shadowy people not in the public face and often not working or paying their fair share in taxes. And once again, for the folks who were absent they day they taught economics in Economics class - income is wages, and wages are set by supply & demand for a job in that job's particular market. Until you can fix supply and demand to be equal across all jobs, industries and geographies, incomes will be unequal. Ironic how Obama supporters unknowingly because they buy into the rhetoric support the very things that hurt them isn't it? Where does the money for the landlord and the gas station come from to buy the fuel? 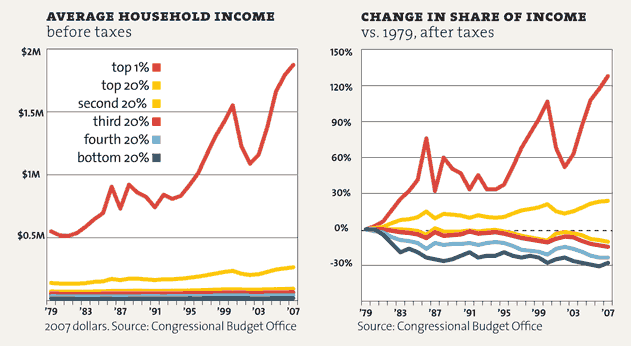 The problem is not that incomes are unequal. The problem is that incomes are unequal to the point where we're similar to a third world country, with the rich taking a huge share of income and amassing wealth.